Gavin Lubbe at the grands. Josh Banuelos is one of the nicest guys in bmx and its been awesome getting to know him a little bit thru these videos and its been my pleasure to be involved with it.Check out part 3 in the series Banuelos rising. Click here for video. I put together all of the expert mains unedited.Check them out. The team did amazing this year.I started the team with the hopes of giving some local kids some exposure on the internet and i think its working out ok.As of today 3 riders have moved on to factory teams and Nick Adams would be a star on any factory team in the country.And speaking of moving on to factory teams, let me congratulate Pablo P-Lo Lopez on his new team Factory Felt for 2013.They are mostly a back east team But with NorCalers like Marquise Montgomery,RC and now P-Lo it looks like they are trying to build on the west coast.Looks like i need to find some more team members before they are all gone. 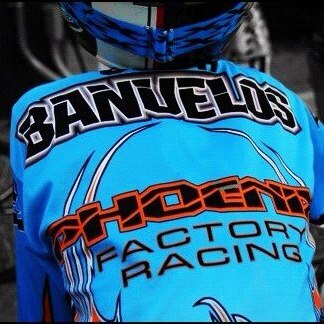 Phoenix Factory grands video part 1. Check out the Phoenix Factory team at the 2012 grands. This video is dedicated to Jordan McMullen.RIP. I grew up loving GOrks work.Westsidebmxs own Cisco Seacrest hits him with some hard questions. Living Legend Mike Redman gives a little insight into the future or bmx for him and the Tribe. I think Jeremy Rommel may be the new Peoples champ. Check out Als interview with Olympian and Real American hero Conner Fields. I always told Kenny every year that we weren't going to the grands unless he was in the running for a nag number, and this year he he was and we did.Ive heard alot of negative opinions about USA bmx since the merger and to be honest i really dont agree with that sentiment.I love that me and my family have a place to do something that weve grown to love as a family and add many new members to that family.Is everything always run perfectly?No.Do i think the west coast has enough nationals?NO.But if youve seen The ABA crew do their thing, you should be impressed.Its not a huge company with thousands of employees, its the same small group of people you see at every national working their asses off.It cant be easy,bmx nationals are controlled chaos to say the least, and the grands is on a whole other level.So first and for most congratulations and thank you for all of your hard work,my family and i had the time of our lives. Back to Kenny.This year we did it a little differant then the last few years.He didnt race alot of locals and he trained away from the track most of the time.It worked out well and now i have something to referencs for next season to make improvements in the program.But as far as kenny personaly i couldnt be more proud of his acomplishments.He worked really hard and had a great year. Check out this video of Nick Adams B-day party. Good afternoon.Ive been neglecting the blog lately, but have still been busy posting bmx content on the web.The truth is im trying to figure out the direction in which to carry out my involvement with BMX.What started out as something i do with Kenny has turned into something that im devoting a lot of my spare time too and not so spare time. I trueley love the sport of bmx but i need to figure out if what im doing is important or if im just wasting my time.Im sure some people will think that what im doing is cool and i should just keep it going, but its getting really hard to spend so much of my time doing it and not ruin my life in the process. Ill keep you posted. Made it out to Santa clara pal and got a few pics during practice. I havent been on here in a while, but ive been really busy with the bmx stuff.Ive been posting tons of pics on facebook and all kinds of videos on youtube. Here are a few pics from the Tangent pro am at the state finals.I think i may be one of Brandon Catos biggest fans.Dudes legit. Heres a video from our 2012 state finals. Jumping has always been one of my favorite aspects of racing.So if you are like me, and you see Kevin Huffman out there take a second and check out his style. I just like this pic of Kenny.Hes really loving his Phoenix frame.At first i just thought the design was just to look different, but the more i check it out im starting to see all off the design features and how high tech it is. Josh Banuelos is one of the coolest dudes in bmx.He is currently on the comeback trail and hes looking really good.Watch for him to be back in the mix at the grands. The Bay Area BMXers are at it again.They were once again spotted at PAL putting in work.Cant wait to see what they do in Reno. The NorCal state finals will once again be upon us.Its always a great time in Roseville hanging out with the homies and watching some incredible racing.Every rider out there will put it on the line to bring home the honor of being state champion and the pro-ams always epic.But what ever you do make sure you check out the older cruiser classes.The number of guys in that class is constantly growing and bragging rights are everything.Napa Valley Crushes' Ben Troia will be there im sure in the mix. I want Kenny to ride like Lee Lewis when he grows up.The Fleas style is so fluid and dialed it almost seems unfair to other riders.He has text book technique that looks effortless.If you ever have a chance to let your kid train with him, you should.You could probably do it tomorrow. You know its a good time when Napa Valley Crush Rider Luke O'Moore is at the track.He worked hard and looked like he had a lot of fun with Cian,Alistair,Summer Pup and the rest of his bmx friends and family today at SuperCamp. Pic from the State race practice at Manzanita park bmx.Can anyone name all of the riders in this pic? 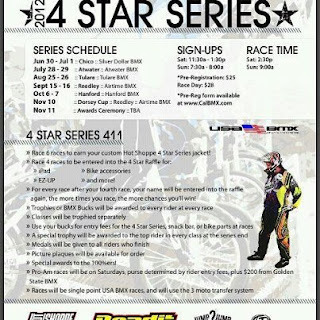 Check out the 4 star series.Its alot of fun and the racing has been great. Check out this video from the second stop in Atwater, Ca. Factory Anarchy rider Austin Hiatt made his way to Manzanita park this past weekend and did well in the Pro-Am.He made a sick 4th to 2nd pass in the last turn and made himself a little money.The Anarchy kit and bike are looking dope and Austins looking fast. The Four star series is upon us once again.We were at the first race and will be filming in Atwater this weekend as well.Its allways a good time at the Four star series.Check the flier for details. I didnt get them all, but i got alot of the mains from Saturday in Vegas.I put them together unedited. Check out this video from vegas.I had enough crashes to make a video. Elite/Vendetta rider Jake Kral is a good rider.Hes fast, great bike skills and hes aggressive.But what i really like about him is the stuff that comes out of his mouth.He cracks me up.Talk to him some time, hes funny. I put alot of stuff on facebook so if your a facebooker, pleas take a second and like my page. It was kinda hard to keep Kenny and Damian from photo bombing some pics i was trying to snap of Bubba the other day.Im not sure where they kept coming from, but they kept popping up in the pics. It seems like just yesterday RJ Bean was raceing with a cast on with a cleat srewed into the bottom.Hes one of my favorite racers but and its been awesome to see him bounce back from an injury so quickly.Keep up the good work bro. Johnny Ontiveros is one of the coolest people ive met in bmx.Its a pleasure to have his daughter Mia on the team even if she is a little photo shy.Its always great to see parents sharing their passion of bmx with their kids, its what its all about. I dont think you can get more Factory looking then Sean Gaian.Hes definitely upholding the tradition of the Factory GT rider.It kinda looks like Gt is building an incredible factory team and Sean is definitely a core part of that. Anthony Lee and the other guy decided to have a scrub contest at a national during a race.I think Anthony got lower but the other guy gets it with the no hander.